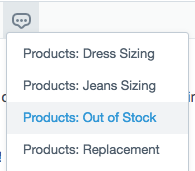 A saved reply is a snippet of text that can be quickly added to the editor when replying to a customer. Using saved replies is a great way to tackle those issues that require a standard or simple response. Don't see the option to edit or delete a saved reply? An account Admin or Account Owner may need to adjust your company's User permissions. See more on that here: Change User roles and mailbox permissions. Head over to Manage → Mailboxes, click on a mailbox, then click Saved Replies from the left-hand sidebar. Click on New Saved Reply at the top of the page. Give your new reply a name, then compose your response in the text editor. If you have live chat enabled in your account, you'll be able to create a reply for email or chat only, or a reply that includes an email and a chat version. Click on the blue Save Reply button when you’re finished. Note: If you’re working in the editor, and you’ve just typed up a response you think you’ll use again, simply select Save this reply… from the Saved Reply drop down menu. You can quickly apply saved replies, or search for a specific reply from that same menu. 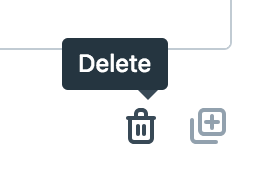 To delete a Saved Reply, open the Saved Reply you wish to delete and select the trash can icon below the editor. To insert a reply into an email conversation, click on the Saved Reply icon located on the editor toolbar. 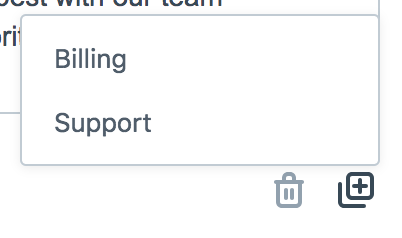 If you have more than 15 saved replies, you'll see a search bar at the top of the dropdown menu. Just start typing to locate the desired reply, and click on it to drop it in. To learn more about using saved replies with chat, see this article. Saved replies are organized automatically in alphabetical order as soon as they’re created. There’s currently no option to manually rearrange replies. Remember: saved replies are text-based so adding a reply to your conversation will not change any conversation properties, like status, or assignee. If you have groups of replies that are similar, you can easily bunch them together using an alphabetical naming convention. When you search for your saved replies, you can simply type the master name, and we'll show you the rest of the nested replies. Can I copy saved replies over to another mailbox? Yes! Saved Replies can be copied and moved into any other mailbox. Just head over to Manage → Mailboxes, click on a mailbox, then click Saved Replies from the left-hand sidebar. Open the saved reply you want to copy, then look for the Copy button in the right-hand corner of the saved reply. Can I use HTML in a saved reply? Basic HTML formatting is supported in email content, but you won't be able to make advanced text or layout changes. HTML is not supported for chat content. Will a saved reply inserted via a Workflow action count in the All Channels report? Indeed! If a saved reply is inserted by way of a Workflow (through the Customize Email portion of the Send a Notification to the Customer action), it will be counted in the Top Saved Replies area of the All Channels report. Can I add an attachment to a saved reply? It isn't possible to add an attachment at the moment.